So I’ve decided to reach back to my old website and repost some blog posts I wrote several years ago about White Cliffs. Over the years many have commented about how helpful the articles were for them. I hope they help you in some way. Here is the first of several that I’ll publish over the coming months. After over twenty years in the wedding dj business, I’ve played just about every venue in MA from Boston to Cape Cod. After working an event, or several at a location, you start to get to know a facility and it’s staff. Over the years I’ve found a handful of spaces that I just love to play and White Cliffs Country Club is at the top of that list. That’s why the October 2006 Spotlight on Wedding Reception Sites review goes to White Cliffs Country Club of Plymouth, MA. Since mid July, I’ve provided the music at White Cliffs for 3 wedding receptions. I’ll be there again for a reception on Sunday (10/8) and am looking forward to it. So what is it that makes White Cliffs special? For me it’s 4 things. The staff, the food, the view and the space. In my view, it’s the staff that makes or breaks a place. With White Cliffs, from the top down, the staff cares about your event. As vendor, I notice how much time an event manager is in view, & at White Cliffs either Jen or one of her event coordinators are always nearby. This makes it simple for me when it’s time to coordinate the wedding ceremony, the lining up for introductions, the cake & special dances. End when things are simple, more than likely the reception will run smoothly which will lead to a great time for everyone involved. What can I say about the food? It’s first class all the way. I know because at White Cliffs I can always count on being well fed with the other vendors you’ve hired for the day. Believe me, in this business we don’t always get this treatment. Often times vendors are sent to the basement or kitchen of a big city hotel with a stale sandwich. How would your prefer your vendors treated. Although your vendors aren’t being paid to eat, I always find that happy vendors can always muster up just a little more effort when treated with repect. I’m sure if you’re considering White Cliffs, a big part of your decision is the view. There isn’t a venue on the South Shore that is even a distant second in this department. Photos look amazing of the gazebo weddings with nothing but ocean in the back ground. A trip down the stairs (a lot of stairs) takes you to a breathtaking backdrop for wedding images. Lastly let’s talk about the space. 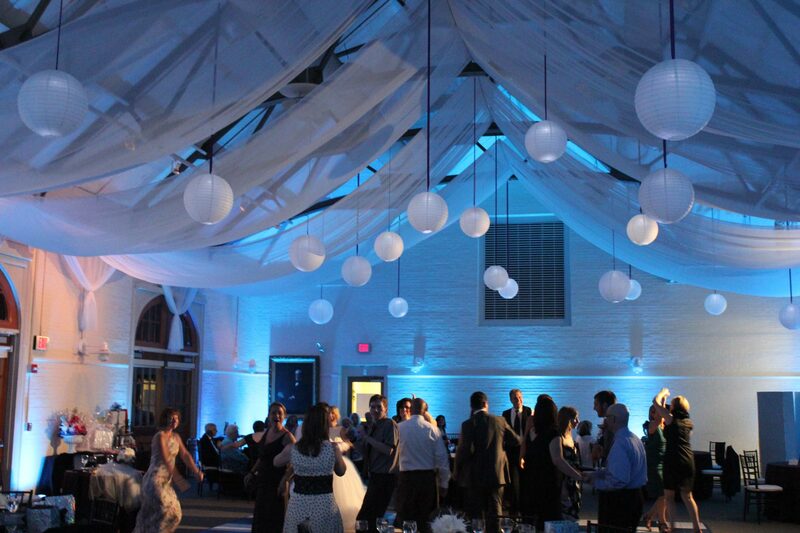 With White Cliffs you get the best of both worlds in an indoor/outdoor reception. First you have the gazebo for ceremonies with the beautiful ocean view. Second you have the ocean itself and the grounds with immaculate flower gardens for photos. Next, the tent for dinner & cocktails and lastly the indoor space for dancing. It’s almost like you have 2 different event spaces, outdoors – perfect for conversation & dining, and indoors a great space for dancing. Although I love the space at White Cliffs it is not the easiest place for a disc jockey to play for a couple reasons. First, during the wedding ceremony, the wind whipping over the ocean makes it difficult to hear the officiant & anyone you’ve picked for readings during the ceremony. For this reason, I offer a special system which includes a wireless lapel microphone for the officiant. It clips to her collar and picks up her voice as well as the bride & groom’s. I also provide a wireless hand held microphone on a stand that is available for readings. I prefer to use 2 speakers, 1 facing the guests and another behind the guests. no matter where you stand, you can hear the words being spoken. A second issue is that the end of the tent is far enough away from the inside space that a seperate system is required in order for your guests to hear what’s going on. This is especially important during the introductions and during the blessing & toasts that usually follow. Alot of dj’s attempt to pull a speaker form inside and place it outside the doorway of the inside space. Trust me this does not work!! Not only is it difficult for your guest to hear what’s going on,when it comes time for speaches which happen at the opposite end of the tent they will be without microphone. Even the very best microphones have difficulty at that range. To address this issue, I bring a complete second system. It sets up in a small area at the far end of the tent and gives us the use of microphones & music when needed. 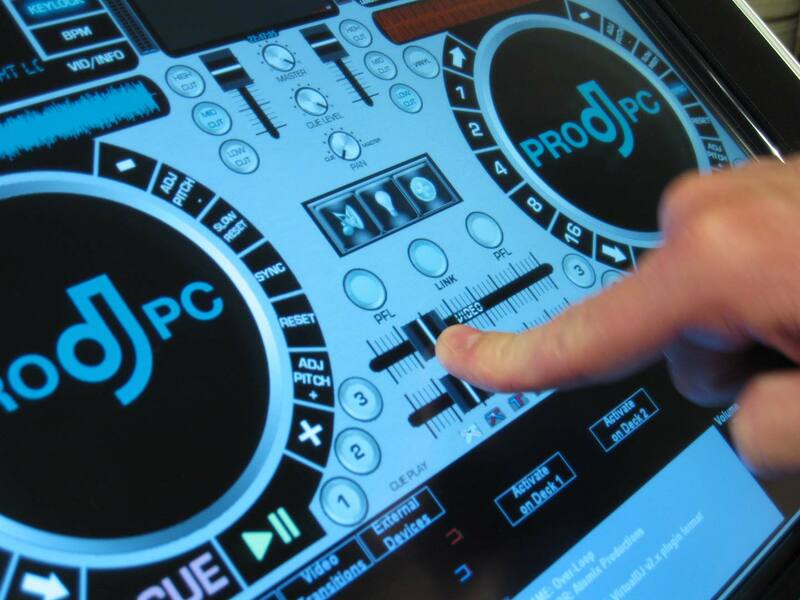 If you’d like to view the sound systems that I use, more information can be found on my dj equipment page or at www.prodjpc.com. Although these solutions seem fairly simple, I think most dj’s aren’t familiar with the space enough to realize the requirement, don’t have the resources or equipment to make it happen, or haven’t (won’t) put the time into turning these small issues into advantages for the space. With a little time an effort that’s what happens. White Cliffs becomes a perfect spot for wedding receptions.